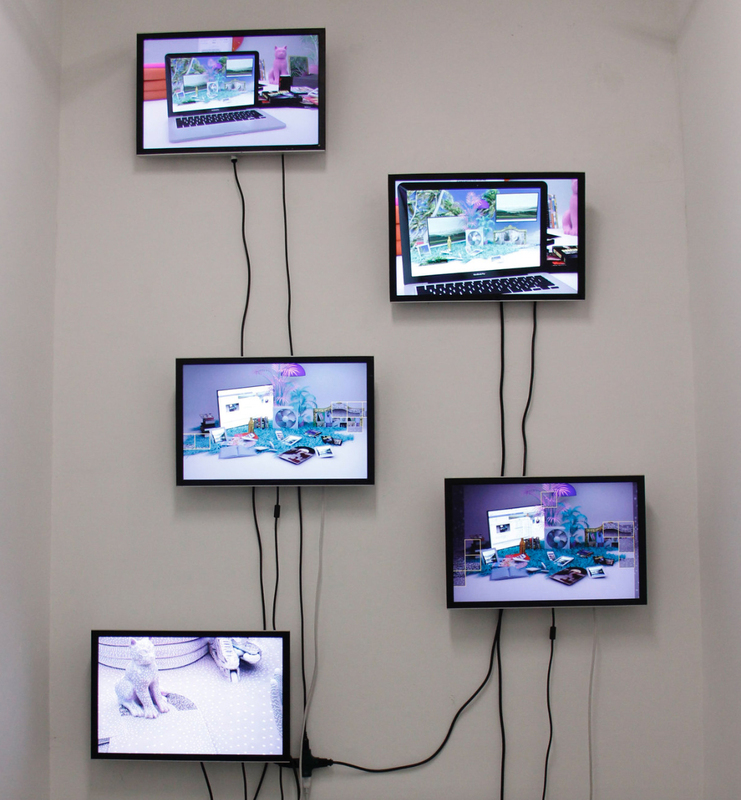 RISD Museum Digital Content Fellow Rocio Delaloye MFA 16 DM creates colorful videos to engage visitors. As the RISD Museum’s first digital media fellow, Argentinian alumna Rocio Delaloye MFA 16 DM is using video to share the work of her colleagues with the larger world and encourage on-site visitors to engage with the exhibitions on view. She was an integral member of the team that won a Society for Experiential Graphic Design (SEGD) 2018 Global Design Award in June for Out of Line, a series of events presented in conjunction with the traveling exhibition Lines of Thought: Drawing from Michelangelo to Now from the British Museum (October 2017–January 2018). “Daily prompts, demonstrations, collaborations and other creative experiments offered in Out of Line enabled practiced artists and first-time visitors opportunities to use drawing as a tool to imagine, discover and explore,” explains Sarah Ganz Blythe, the museum’s deputy director of exhibitions, education and programs. Delaloye’s primary role on the team was producing engaging, colorful, bilingual videos demonstrating the various drawing techniques presented in the exhibition. “I collaborated with the museum’s graphic designers to select a color palette and also incorporated the typeface they used for print pieces and labels—MAD—into the videos to make everything feel cohesive,” she says. 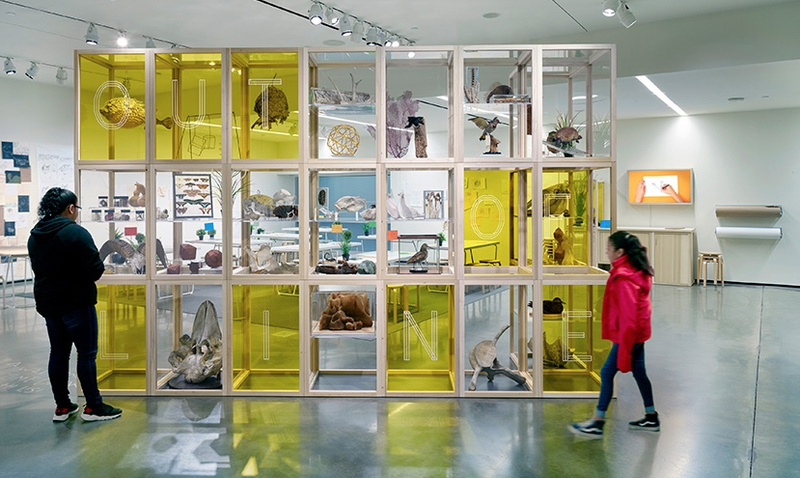 The museum’s award-winning Out of Line project featured a contemporary cabinet of curiosities full of specimens from the Nature Lab for people to draw. Delaloye says she’s “grateful for the opportunity to grow and experiment” as a museum fellow. She had initially worked as a grad assistant at the RISD Museum four years ago while earning her MFA in Digital + Media. 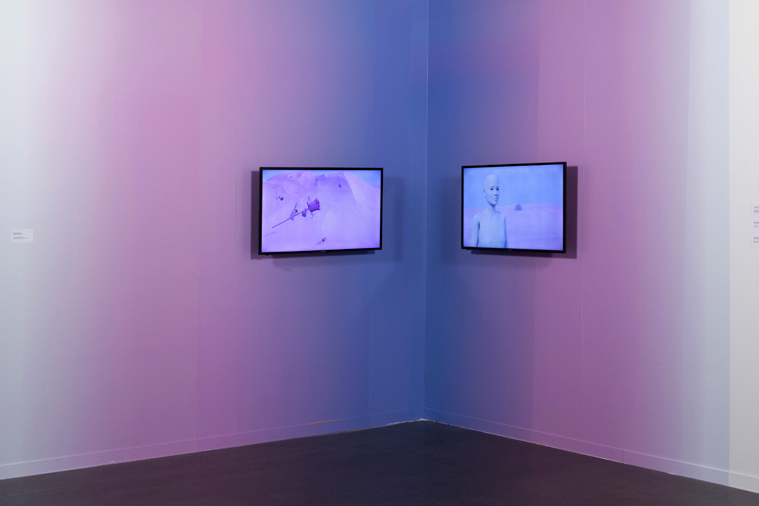 At the start, she recalls, she encountered resistance to the idea of introducing digital content, but soon curators and educators were hearing her out and even approaching her with their own ideas for incorporating video. A recent video Delaloye produced with Digital + Media faculty member Stephen Cooke has been used in multiple ways by the museum’s marketing team and is currently appearing on PBS Television. “We attached a camera to a drone and flew it from Market Square to the Chace Center entrance of the museum to capture the feeling of the space,” she says, noting that when she was “searching for content about the museum” as she was working on her RISD application in Argentina she found little that was helpful. But Delaloye had no doubt that RISD was the school for her. She thought about applying to the graduate program in Graphic Design—the medium she studied as an undergraduate in Argentina—but decided instead to focus on digital media. She originally envisioned herself working on a commercial platform like Facebook or Google after graduating but had a change of heart during her first semester at RISD. Delaloye’s thesis project, The Left Hand of Darkness, reflected on the transitional nature of identity. Delaloye pushed through this period of “creative crisis” with the support she received from faculty and remembers feeling particularly connected to Venezuelan faculty member Rafael Attias 91 GD, who signed on as her thesis advisor. Her final project, The Left Hand of Darkness, reflected on the transitional nature of identity and our double-edged entanglement with technology and social media. Now that her fellowship is coming to an end, Delaloye is planning to move to New York City and augment her commercial video work by focusing on her artistic practice. She’s been thinking a lot about American culture and her personal take on the immigrant experience. “People in this country want to put a label on everything,” Delaloye says. “In Argentina I’m not considered a minority, but here I’m labeled a person of color.” In other words, living in the US gives her an entirely different perspective on identity, she explains, even if it’s strange to no longer be seen as who she always thought she was. Still Life (2016, detail) examines digitally oriented consumer culture. The RISD Museum prepares to launch a series of artist-curated exhibitions celebrating the seminal 1969 show curated by Andy Warhol. Textiles major Anna Pederson 18 TX builds on her studio education through an apprenticeship in the RISD Museum’s contemporary art collection. Earlier this month students in Digital + Media participated in Since The Epoch, an exhibition at Boston Cyberarts Gallery that caught the attention of the local creative community.